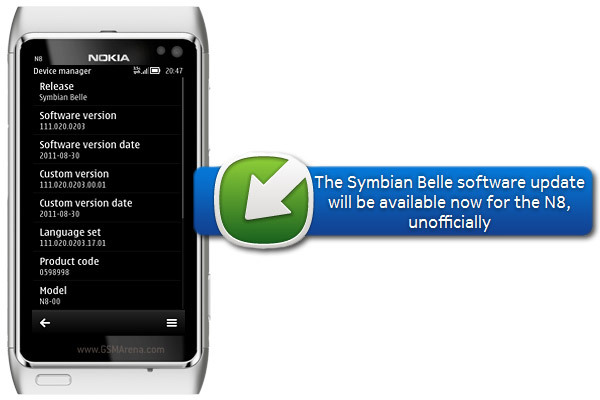 Symbian Belle will debut with the Nokia 600, 700 and 701 trio, but the older Symbians should be getting it soon after that. Yet if you are knowledgeable and brave enough to flash your smartphone with a custom ROM, Belle has been available for a few weeks now. And now there’s a newer ROM for the Nokia N8 available that should be much closer to the final deal. Still, as with all software that isn’t fully finalized, there’s a risk of trouble (some bugs at the least), but Nokia’s Head of Social Media, Mark Squires, has already installed Belle on his N8. The new firmware is N8-only and supports only English and Russian languages. You can grab the files from Symbian Coders, where you’ll find flashing instructions, too. Again, this is a proceed at your own risk deal. Mark Squires reports improved performance on the N8 with Belle, so that’s something to look forward to. You can have a look at our Nokia 701 preview for our thoughts on Symbian Belle. The Nokia N8 seems somewhat privileged (or maybe it’s just that N8 owners are lucky), getting a dedicated camera update and now this leak. Thanks for the tip, Nabkawe.